I'm working on a circuit and I can't find information on this component (see picture). This hybrid circuit is part of an old industrial PSU. It is a PFC circuit based on UC3854 but I don't know if the device I'm trying to identify is directly involved in power factor correction. 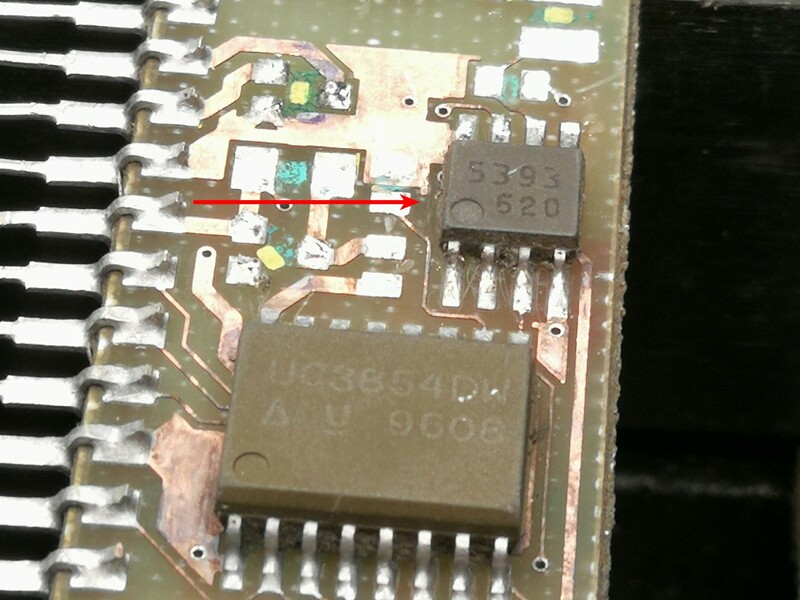 The SMD code is "5393". I have some of this chip and the number at the bottom changes from one component to another. Pin 4 is GND and pin 8 is VCC. Judging by the connections, it would appear that pin 7 is an output. Pins 2-3 and 5-6 may be inputs. The package is a sort of SOIC, the body is approximately 4.40 mm x 5.16 mm, like the Panasonic SO-8D or Renesas PRSP0008DE-B (JEITA P-SOP8-4.4x4.85-1.27). This equipment is from the first half of the 90's. Seeing this circuit I think the right side could be a comparator; on pin 5 there's a sort of reference voltage related to the "19V" (auxiliary PSU voltage?) compared with the 380V (DC voltage before the switching section of the PSU) on the pin 6. While 380VDC are OK the hypothetical comparator output on the pin 7 keeps on the pass transistor Q1 (I suppose this is a kind of enable signal to the power switch drive section). 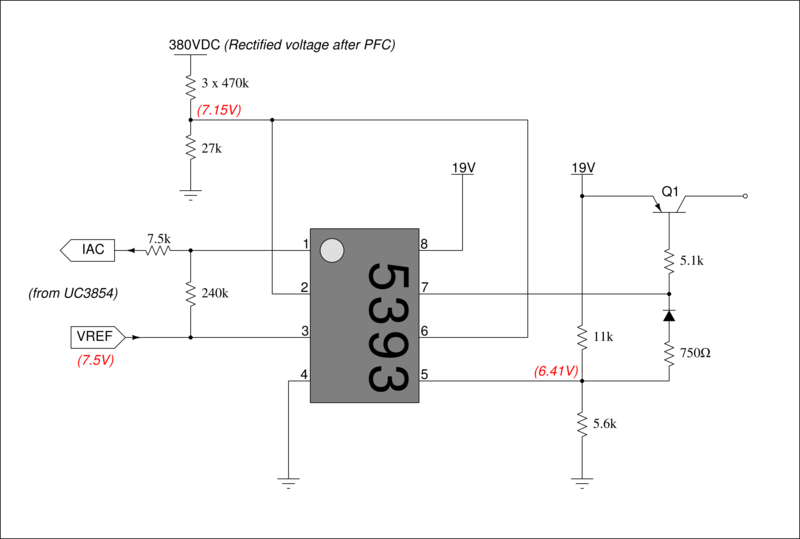 Also the left side is like a comparation between the 380VDC and VREF (generated by UC3854), but I don't clearly understand the output circuit. If my assumptions are right the device could be similar to some dual comparator like AN1939 or LM393 but I can't find any evidence that there is a device named or marked "5393" similar to these devices. After googling the code 5393 I stumbled across this datasheet. The component appears to be the Toshiba TA75393F, and for me it matches your schematic perfectly. It seems like you're using the 7.15V reference to detect the presence of the 380VDC, in fact this reference is hooked to the "-" pin of the comparator, and in the case of the comparator B, once the reference disappears, the output goes to low making the PNP transistor conducting. On the other side, the comparator A with the positive feedback branch makes me think of a comparator with hysteresis. 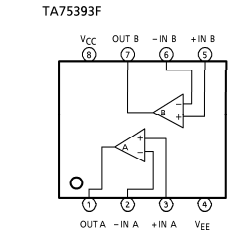 According to this question it could be an overvoltage detection circuit (and in this case the higher external reference would make sense since you want to trigger your comparator only in the case when the 380VDC source has an overvoltage). Not the answer you're looking for? Browse other questions tagged power-supply switch-mode-power-supply identification surface-mount or ask your own question.